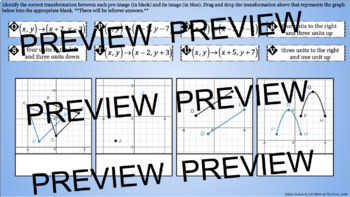 - In this digital activity, students will be able to describe the properties of translations and their effect on the congruence and orientation of figures. They should be familiar with arrow notation and the parts of a coordinate plane (quadrants, axis, ordered pairs etc). 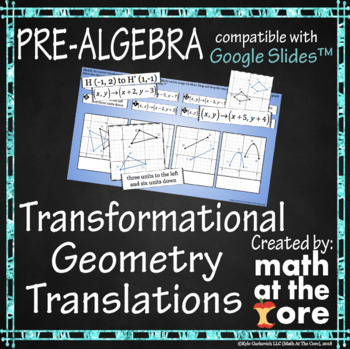 - This activity includes 31 different problems involving translations from given graphs to ordered pairs to descriptions of the transformation. Students may have to identify what the translation was or what the new coordinate is based on the translation. The problems increase in difficulty as they move through the slides. Available in the full curriculum bundle! 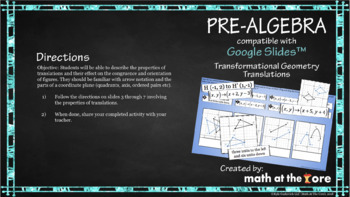 - All students and teachers using this activity must have a free Google account to use this activity on the Google Slides interface. 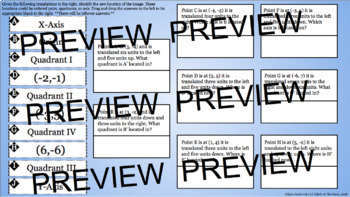 Students can complete the activity and share it back with their teacher. **DOWNLOAD INCLUDES - A pdf file explaining the activity with a link to click to copy the Google activity to your drive. It also includes the answer key (not available in the Google Slide).